Load up three of your favorite hunting buddies – plus your must-have hunting gear – and keep them safe during transport with Owens Products Hunter Series Triple-Compartment Dog Box with Top Storage. Full-length storage compartment on top stows guns, dog accessories and more. 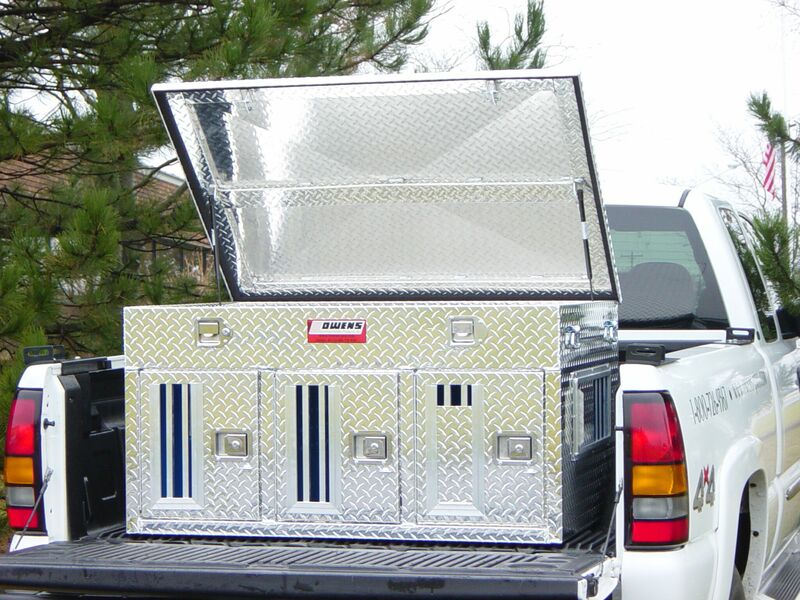 Three large compartments ensure your dogs stay protected and comfortable during long drives to and from the field. Rear and 10”L x 7”W side vents maximize breathability. Plus, included storm covers can be placed over the holes and vents to keep out the elements. Lockable slam-latch doors with storm covers for increased security. Rugged diamond-tread aluminum construction provides years of reliable service. Rattle-free spring-loaded carry handles. Made in USA. 36”L x 48”W x 26”H. Storage: 48”L x 36”W x 6”H. Compartment: 35”L x 16”W x 18”H.